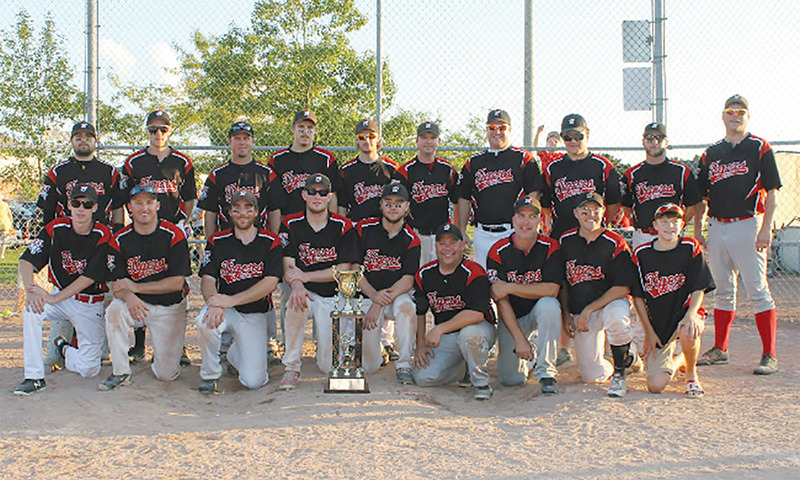 The Brussels Tigers capped off another terrific season by winning the Huron County Fastball League’s (HCFL) year-end tournament over the weekend. The squad entered last weekend’s championship tournament with a 17-2 record, the best in the league, with only the Wellesley Wildcats being close, in second place with a 15-4 record. Finishing first in the regular season gave the Tigers a bye through the first round of the year-end tournament held in Listowel and Monkton over the weekend. The team’s first game was against Milverton at 11:30 a.m. on Saturday. Shawn Daw pitched the five-inning game as the Tigers mercied the AW Millwrights 9-2. The mercy would be the first of many throughout the tournament. The Tigers’ second game was at 5:30 p.m. on Saturday against the Goderich Grizzlies. Dennis Dewar started the game with Ty Sebastian coming in for the save and a 6-4 victory for the team. Next, the Brussels Tigers faced off against Wellesley, with Sebastian pitching in a 13-0, five-inning mercy. The win gave the Tigers a berth in the finals on Sunday. Extra inning games pushed the final from 4:15 p.m. to 5:15 p.m. on Sunday. Sebastian pitched again and the team completed its second shut-out of the tournament, mercying the Wingham Hitmen by a score of 8-0. The win marks the Tigers’ second HCFL championship in a row and its third in four years. Daw said that the championship marked the end of a “great and a successful year” and that the team thanks all their fans that supported the team all year long. For full results from the tournament, check out hcfl.bravesites.com.